Making a positive difference in the communities we work is a vital part of our sustainability strategy. Our Community Investment Group supports our project teams in the delivery of local community engagement projects. Project manager Stephen O’Brien is dedicated to maintaining communications with neighbours and the surrounding community. If you have any questions, please do get in touch with Stephen, who is keen to help in any way he can. 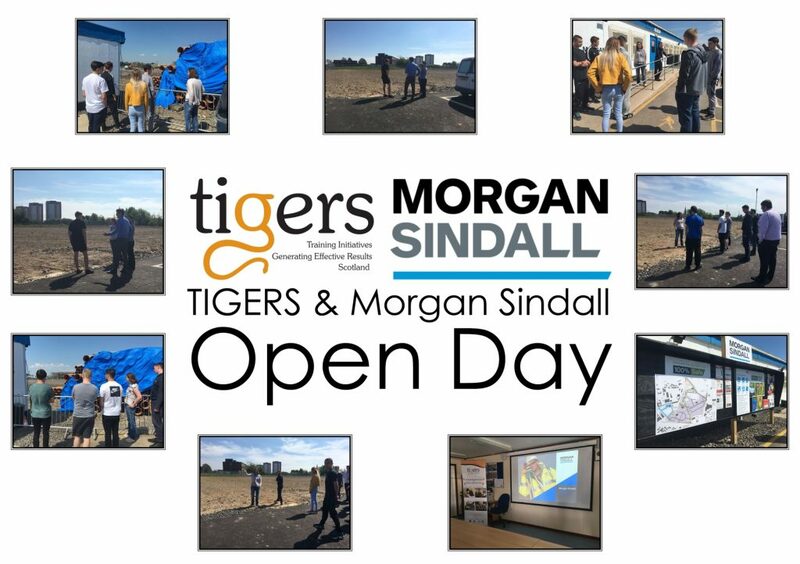 You can contact the team on sighthill.tra@morgansindall.com. We’re also a member of the Considerate Constructors Scheme, which has a Code of Considerate Practice designed to encourage best practice beyond statutory requirements. 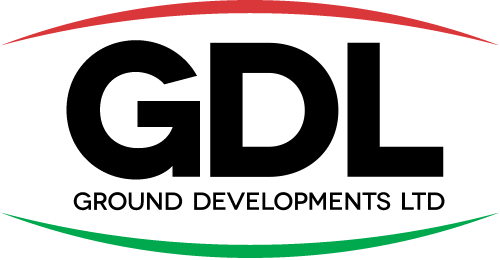 This page provides a snapshot of activities we’ve been undertaking in the local community. As part of the Glasgow City Region City Deal Initiative Morgan Sindall has signed up to a number of project specific Key Performance Indictors (KPIs). These include creating employment and training opportunities, engagement with local schools, colleges and universities, and supporting the local community. Nicola Gooch is our dedicated Community Benefits Advisor and it is her task to work with the project team and the subcontractors to ensure that the KPIs are met by the end of the project. 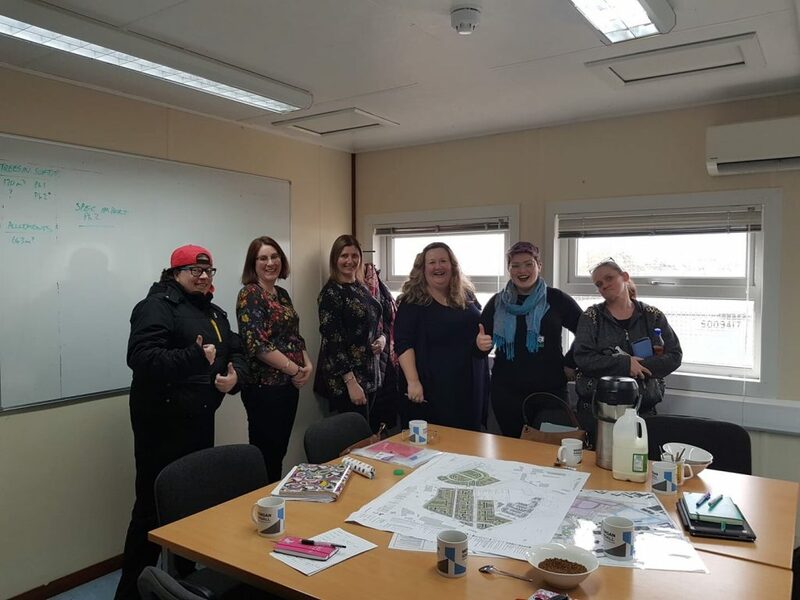 Community Benefits Advisor Nicola Gooch hosted a meeting with Sighthill residents, councillors, community partner New Rhythms for Glasgow, and future developers Keepmoat, to discuss the ongoing support of community projects in the area, and some new ideas. The St Stephen’s Primary School Eco-Committee visited Sighthill on 21 January to have an audience with John Murray, Environmental Manager. John talked to the group about invasive species and how we care and protect wildlife when we’re working. The children were particularly enthused about where birds manage to build their nests, including in the engines of plant and also what they find on construction sites to build their nests with – especially the bird who thought a nest of nails would be comfy! The eco-committee will visit the site on a quarterly basis to interview various members of staff. They’ll then complete a front page newspaper report on their visit, which we’ll upload here. Our engineer Alasdair Klimowicz is visiting St Stephen’s Primary School with with Ivor Goodsite, mascot of the Considerate Constructors Scheme. 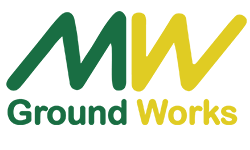 You can find Ivor’s website, featuring a Kids Zone, here – https://www.ivorgoodsite.org.uk/kidszone/. 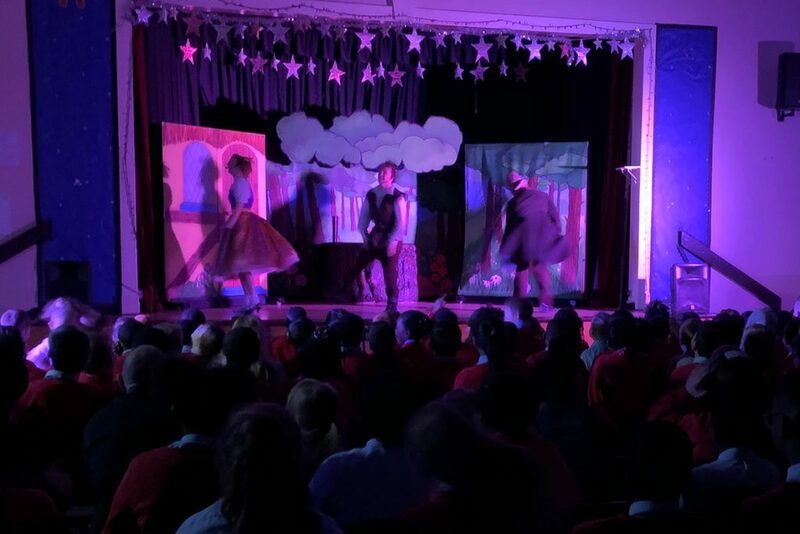 We booked a theatre company to visit St Stephen’s & St Kevin’s schools to perform a pantomime for the children just before the Christmas break. The pantomime is sponsored jointly by the Sighthill TRA project and by Keepmoat, future developers of the finished site. You can see more photos on our timeline page. 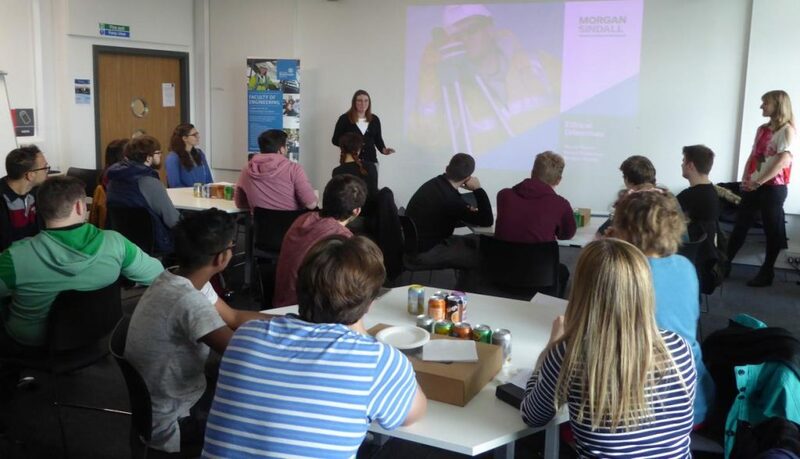 Community benefits advisor Nicola Gooch and bid manager Emma Parkinson hosted a lunchtime discussion session with future engineers at the University of Strathclyde. We provided a well-received lunch, and facilitated discussion in a new lunchtime debating club for the University’s Faculty of Engineering, discussing ethical dilemmas faced by modern engineers. Thanks to Emma for your support, and also to Mike Murray, teaching fellow in Construction Management, for letting us come along and engage with the students. Mike advised us that the students found the event and discussion highly interesting and inspirational. We welcomed five S6 pupils from Hutcheson Grammar School, in the Southside of Glasgow, as part of their recent work experience placement. 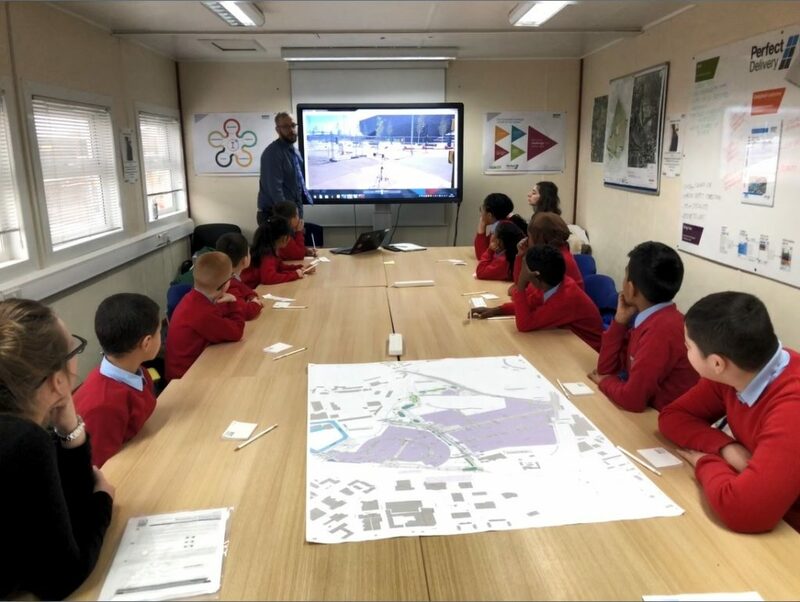 The pupils, who spent two days at the Glasgow Region City Deal project office, visited us to learn about the economic relationships involved in a project such as Sighthill TRA Contract 2. They discovered more about our role within the Sighthill TRA Masterplan, and were also taken around the site to allow them to see the scale of the regeneration that is happening within this area of the city. We were delighted to host Agnes Sande as a work experience placement for 12 weeks during the summer. Agnes, who is studying for an HNC in Quantity Surveying, came to us through the Bridges Programme, a charity set up to help people who have English as a second language. We’re also currently hosting Mudrik Ahmed as a civil engineering work experience placement. Mudrik is in the second year of his Foundation Apprenticeship in Civil Engineering, joining us on site for one day a week alongside studies at Glasgow Kelvin College and St Roch’s Secondary School. He’s been with us for work experience since April, and will remain with us until September 2019 – upon completion of his second year he’ll achieve a NC in Civil Engineering. 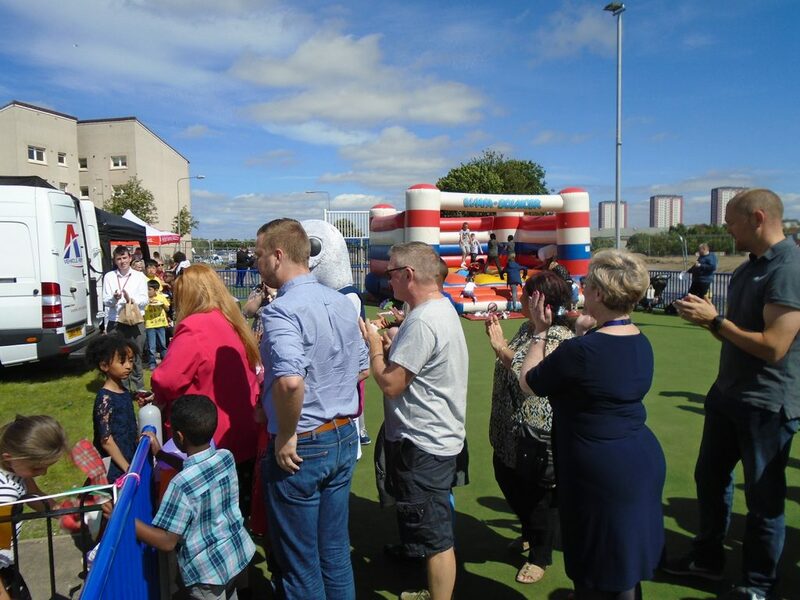 The Sighthill Big Day Out event saw representatives from Glasgow City Council and Glasgow City Region City Deal, developers Keepmoat, GHA (Glasgow Housing Association) and Morgan Sindall attend the opening of a new Multi Use Games Area (MUGA) adjacent to our site. Morgan Sindall sponsored the barbecue and provided footballs and games for local children, which were enjoyed on the day. Morgan Sindall has also provided some gardening equipment and storage for the use of GHA residents who live adjacent to the site. Glasgow City Council have produced a video of the opening. We’re particularly proud of our unique on-site training initiative with TIGERS (Training Initiatives Generating Effective Results Scotland), where 15 young people have benefitted from an eight week training programme delivered on site. This unique model has given the trainees real experience of construction work in a controlled environment within an active site. Out of the 15 young people who started the course, 13 have now started or completed their work experience placements. As of 22 October, five young people have started full-time employment. Three have been employed with the landscaping contractor Ashlea and will start an SVQ in Horticulture at the beginning of April 2019. 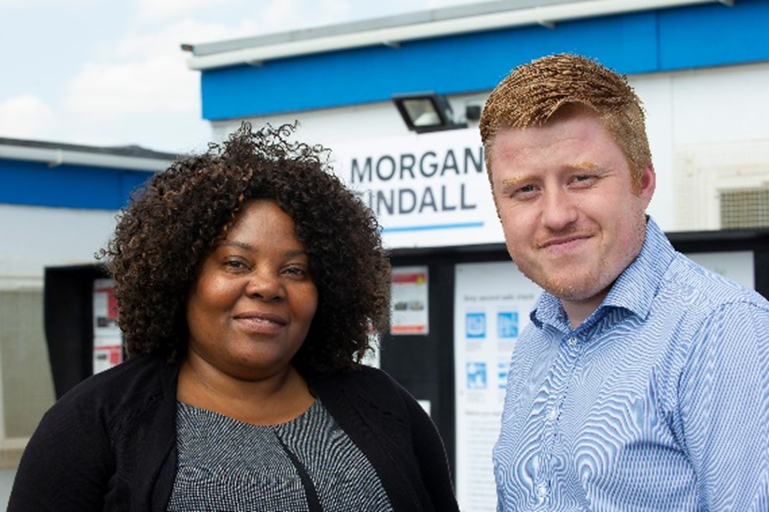 Morgan Sindall currently has two candidates on work placement, with the hope of being able to offer them both job roles and the chance to study towards an SVQ Level 2 in General Construction Operations and Civil Engineering. The other five candidates are still out on work placement, with the hope of them being able to secure full-time employment prior to the end of their work experience. A new sewer tunnel will contain 265 metres of sewer pipe, equivalent to double the height of Glasgow Tower or three football pitches long. At its deepest it will be 21 metres below surface level, equivalent to two buses parked end to end.